November has flown by and our hashtag #FSBlockPartybee is going strong! I wanted to share the FreeSpirit Block Party book schoolhouse before the month was out and I am just in time with it! This is the first time I have organized an online bee, and I want to keep it going! 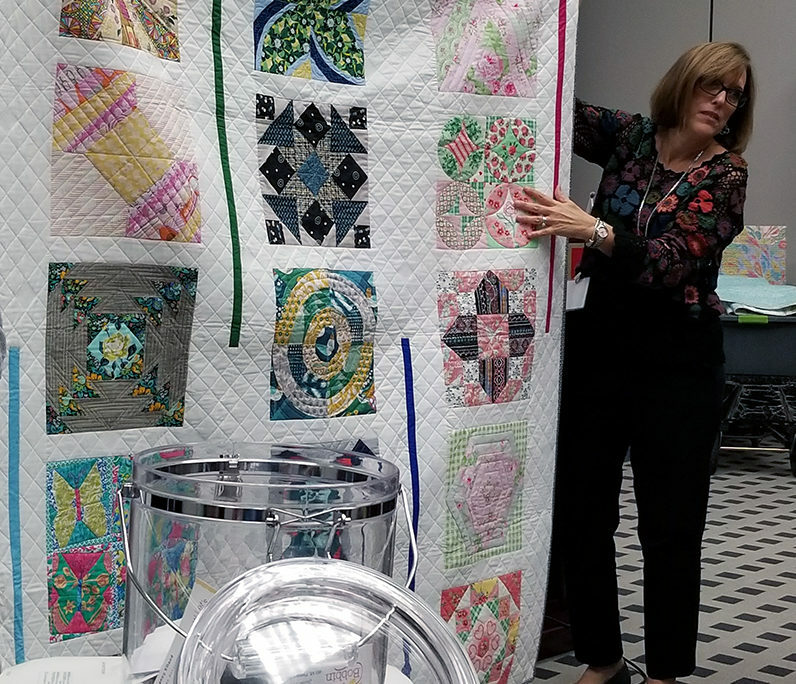 For those lucky enough to attend Quilt Market in Houston, the Friday of Market is called Schoolhouse. 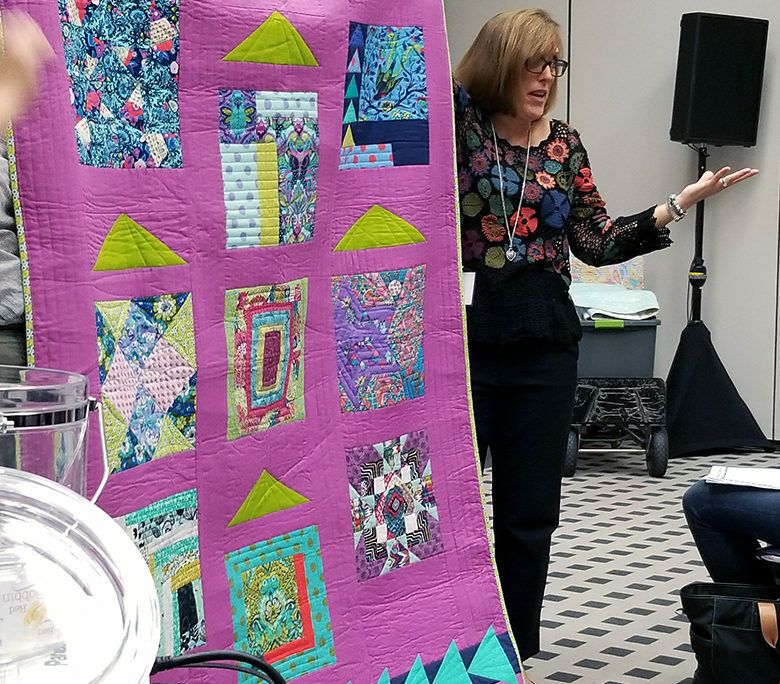 All day you get run to different classrooms and learn about the latest and greatest from designers, fabric companies, influencers, tools, business, and more. 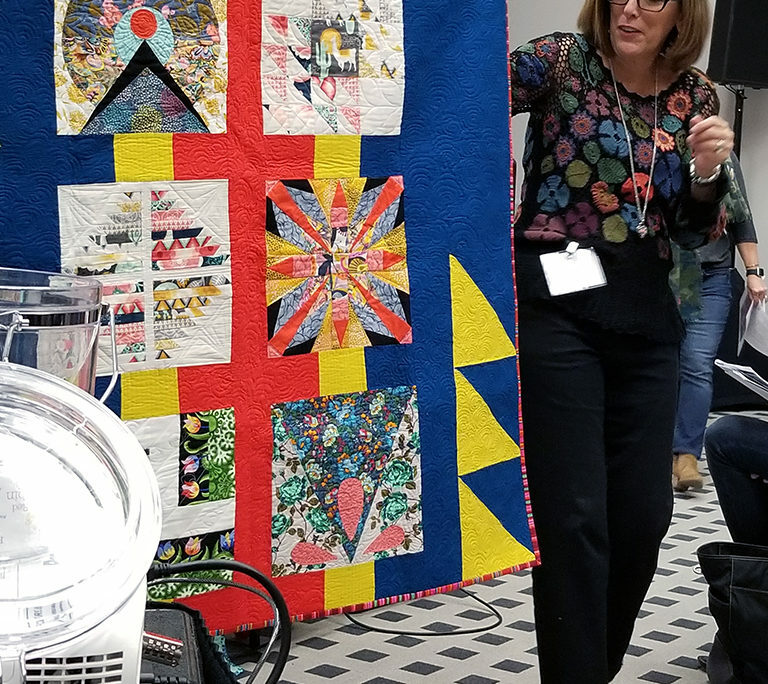 FreeSpirit Fabrics and C&T Publishing held a schoolhouse for their brand new book and our favorite, FreeSpirit Block Party! It was nice to meet Nancy Jewell in person, one of the co-compilers of the book. She whole heartily believes in what the book stands for and it was so nice to hear honest passion! 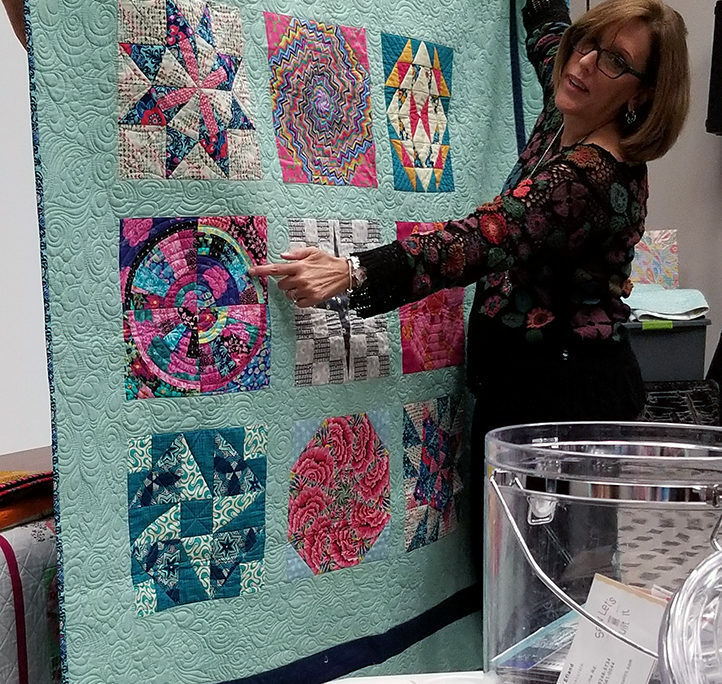 Collecting these blocks from different designers, creating quilts that show off all this amazing talent, and with it all going to such a good cause. 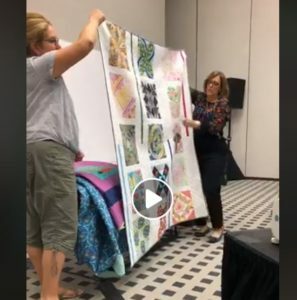 Now FreeSpirit Fabric school houses are always great and full of people, so was very happy to see how packed the room was for this book! Cozy, the 55″ square that features four blocks. Tribal, 50″ x 48″ featuring six blocks. Neghibors, 54″ x 80″ featuring nine blocks. Subdivision, 64″ x 68″ featuring fifteen blocks. Over Here, 67″ x 67″ featuring nine blocks. I am in love with Over Here and Cozy designs. And isn’t it cute that the sampler pattern names all relate to people, houses, living together? A block party, per say? It’s one of those things I ‘realized’ late at night looking at the patterns. Completely intentional I’m sure! LOL. For those that may be making one of the samplers I realized something they all have in common. 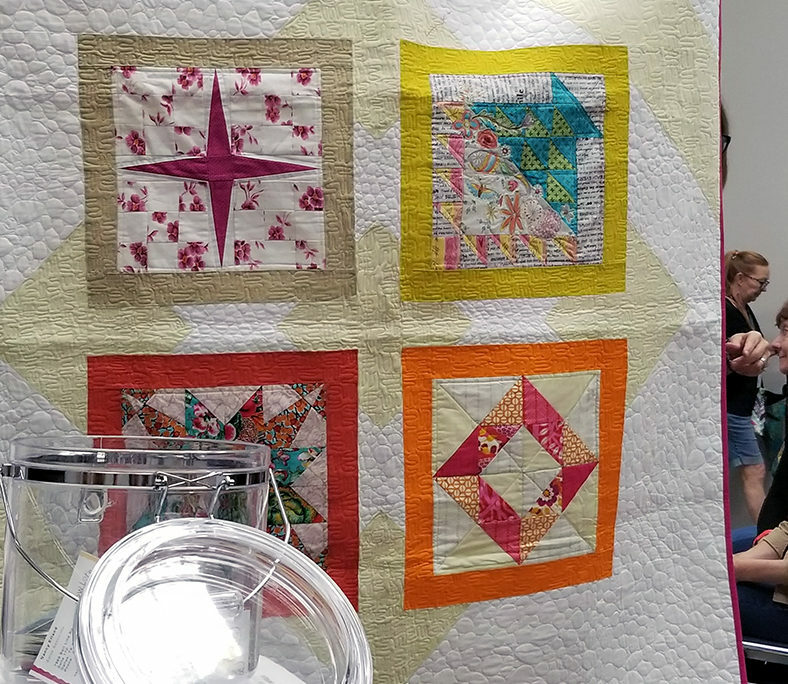 The quilts show off all these amazing FreeSpirit Fabric designers fabrics and geometry but to be able to show that so well, all the quilts use solid colored fabric for the backgrounds. These solids compliment the blocks and let the blocks shine. A perfect way to create a sampler quilt, the backgruond should assist your quilt – not detract! http://handmade3d.me/wp-content/uploads/2018/11/20181102_125324.jpg 1024 768 handmade3D http://handmade3d.me/wp-content/uploads/2018/10/rectangleLogo-300x121.png handmade3D2018-11-29 02:12:152018-11-29 02:15:40FreeSpirit Block Party Schoolhouse!